Diskspd.exe is great to generate read write activity in a volume (regardless it’s a local disk or coming from a SAN like my case) using different parameters to hammer it in a variety of ways, trying to replicate the multiple ways SQL Server performs IO operations. In this post I am not going to get into many details about the tool itself, but in how to process the generated output for baselining or benchmarking our storage subsytem. There are multiple operations that require SQL Server to interact with the underlying storage subsystem and also plenty of misconceptions around it. As for most of the questions related to SQL Server, there is no an absolute truth that applies blindly to each and every case. I strongly recommend you take a minute to read an article written by the MCM and MVP Argenis Fernandez (b|t) called What is SQL Server’s IO Block Size? to see what I just told you, because that will give you a better understanding of the kind of tests you should be performing to benchmark your storage. Using real SQL Server block sizes can give us a good idea what our storage can be good at. For instance if we see good read performance but not so good when writing 60k blocks, we can guess that database files with most read activity are good candidates, but the transaction log file is not. There are lots of articles and posts explaining how to use this tool, so I’d rather point you there and only take a sample to show you how to process it. The most complete documentation is here and some articles from Jeremiah Peschka and Glenn Berry will help you too to hit the ground running. See how I chose the parameter to match with I believe would be the most similar to SQL Server activity, in this case the block size is 1MB, only writes, 8 threads and 1 target file. You can tweak it to match your specifics, but as example I guess this is sufficient. And that’s the goal of this post, to show you how to easily parse the XML output in a way we can keep in a database for future reference. So let’s roll our sleeves and get to work. I mean me, not you that only have to copy paste this to make it happen. Coming from a development background, I just love writing code, so this is what I came up with after getting bored of looking to a few txt output files. --              - @simplified   -> will return just one row with general info and IO totals, including IOps, throughput and latency for Reads and Writes. --              REPUBLISH ALTERED CODE AS LONG AS YOU INCLUDE THIS COPYRIGHT AND GIVE DUE CREDIT. I decided to return data in two different ways, one very simple with aggregated data and another more granular with most the details you would find in the text version of the output. The simplified version, which I recommend to store in a table for the future, will look like this. 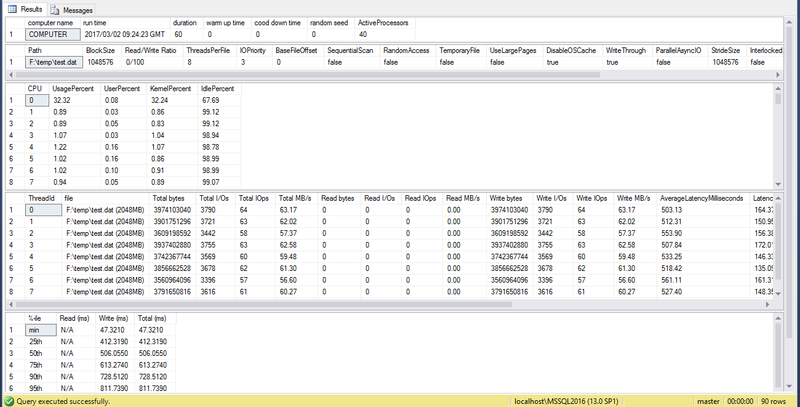 See how the performance it’s not too bad, in this case I’m interested in the throughput to the MB/s will tell me that. Since I run the test for only writes, the total will match the writes, otherwise will be the combination of reads and writes. Obviously processing this output would be more laborious, but possible and will give you more insights of the test you have performed. This has been a short post, but hopefully it will be useful for you to benchmark and monitor your storage subsystem. Thanks for reading and any question, please use the comments below. Statistics and Data types, What can go wrong? Once you have the output file, you have to place it in your server (or a share where you can access from your SQL Server) and then run the stored procedure, which will parse the XML to return meaningful data you can keep for later analysis. Great work, Thanks for the code, it’s working well. do you have the code for extended version as well ? Thanks Harry, the SP contains both versions, you just need to call it using @simplified = 0 to get the multiple resultsets instead of 1. Great Script. It simply does the job. A real time-saver. Thanks Andreas for your comment!, I’m pleased you find this useful.